40/55 Reagen Sulewski "..and then I met some nuns and lepers and became a Marxist. That's why it was the best summer vacation ever." 61/126 Kim Hollis Gael Garcia Bernal is sooooo pretty. 66/92 David Mumpower Planes, Trains and Automobiles for South American commies. There's nothing quite like the coming-of-age story of a Marxist-in-training. Way back in the early 1950s, a 23-year-old Che Guevara, Argentinean medical student with a specialty in leprology, joined friend and biochemist Alberto Granado on a grand adventure. The pair left behind the comfort of their Buenos Aires home, hopped on an ancient 1939 Norton 500 motorcycle and set off on a journey across the South American continent. Over the next eight months, the young men's bike would break down and they'd find themselves forced to hitch rides to get from place to place. Far from the familiar surroundings and big city life of Buenos Aires, Guevara and Granado begin to see a different Latin America than the one they believe they know. As the pair journeys through a series of adventures both dramatic and comedic -- stowing away on a cargo ship, falling off their bikes, drinking heavily, and sacrificing of themselves by volunteering as firemen -- their perspective on the world grows with them. Ultimately, their grand adventure culminates as they scale the peaks of Machu Picchu, where they are overcome with emotion at the significance and history of their own Incan heritage. Finally, they find themselves deep in the Amazon rainforest. There Guevara and Granado discover a leper colony in need of assistance. Appalled at the economic situation that has put these suffering souls so far out of reach, a hunger stirs within both young men's bellies that will eventually be a determining influence on the ethics and politics they follow in their own lives. At the end of it all, Guevara and Granado's journals were published worldwide as The Motorcycle Diaries, which has been a popular read in the Jack Kerouac vein. Eventually, Guevara's vision paved the way for him to become the leader of the Cuban Revolution, impacting not only that small island nation but also numerous other countries along the way. 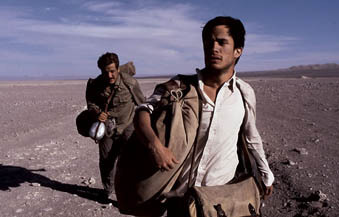 Based on the episodic nature of the two friends' adventures, The Motorcycle Diaries lends itself very naturally to a theatrical adaptation. And it's consummate storyteller Walter Salles (Central Station, Behind the Sun) who goes behind the camera to capture the adventure and character development of one of the most influential men of the 20th century. Also lending his name to the film's pedigree is up-and-coming young actor Gael Garcia Bernal, who has so far already turned heads for impressive performances in both Y Tu Mama Tambien and The Crimes of Father Amaro. Interestingly enough, this will be the second time that Bernal will portray young Che Guevara, as he also did so in the 2000 television mini-series Fidel.